Is it just me, or are we seeing a resurgence of SHMUP or Twin-Stick style games lately? I feel like every other day we're adding some new title to our database that combines fast paced bullet-hell like gameplay with some other genre-bending element. Today that game is RiftStar Raiders, a new title from Climax Studios. The game features nine missions with co-op play for up to four players across a space themed story. 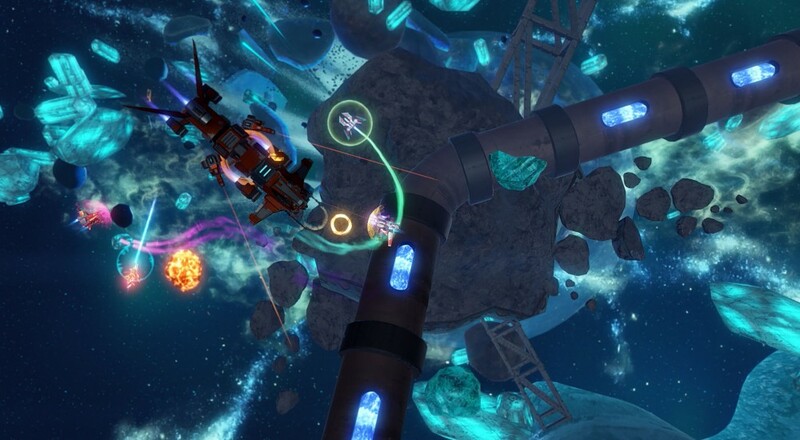 Unlike arcadey shooters in the genre, the game emphasizes physics of flight in space and players will have to utilize that to their advantage. The core of the game is about loot collection, with each mission yielding a bounty of goodies to upgrade your ship and help your squad complete missions more efficiently. In Riftstar Raiders it’s all about the loot. There’s a lot of perks to loot and, when combined with their unique tech trees and upgrades, lets you craft and customise new weapons, shields and boost drives. This lets you create the ship systems that match your play style and role within your squad: Want to be the tank shielding your team-mate? Or are you more the striker hammering enemies? Maybe you want to be the healer or support class in order to help your team survive tough situations? There are tons of possibilities for you to discover and experiment with. That’s without even mentioning the cosmetic customisations you can apply on your Raider spacecraft: change hulls, skins, banners, enough to make it your own. No release date has been set for RiftStar Raiders, but it will find it's way to the PlayStation 4, Xbox One, and PC sometime in 2017. Page created in 0.9149 seconds.